Today we’re going to visit a self-advocate who leads by example. 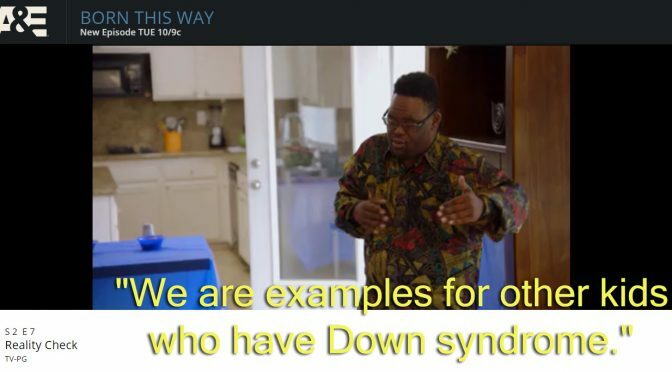 John Tucker from Born This Way on A&E proves, beyond a shadow of a doubt, that Down syndrome is nothing to be afraid of. He does it by lovin’ life and showing us how it should be done! During the first season of A&E’s groundbreaking Born This Way, we got to meet seven young adults with Down syndrome and their parents. In six short episodes, fans fell in love with these dynamic individuals. Critics did too. So much so that the show has been nominated for three Emmy awards including Outstanding Unstructured Reality Program and received a Television Academy Honors Award. This year we celebrated a new docu-series about young adults who have Down syndrome. Born This Way on A&E introduced us to talented rapper – John Tucker. For many reasons, I’m so glad we got to meet JT and his family. In the final episode of season 1, we got to see his music video – “Shake Your Booty,” and during the 321 eConference, we got to meet the director of the Performing Arts Studio West where John practices his craft! Watch John at work with the support of his family as back-up dancers!